There's No Place Like Home: If You Stand Still Long Enough, I Might Paint You Turquoise! If You Stand Still Long Enough, I Might Paint You Turquoise! I've been getting projects done about 10 minutes at a time here and there. I have come to the conclusion that I am just not going to have a big chunk of time all at once. Not until Katie goes to college. That's why spray paint is my best friend. It can change something super fast! 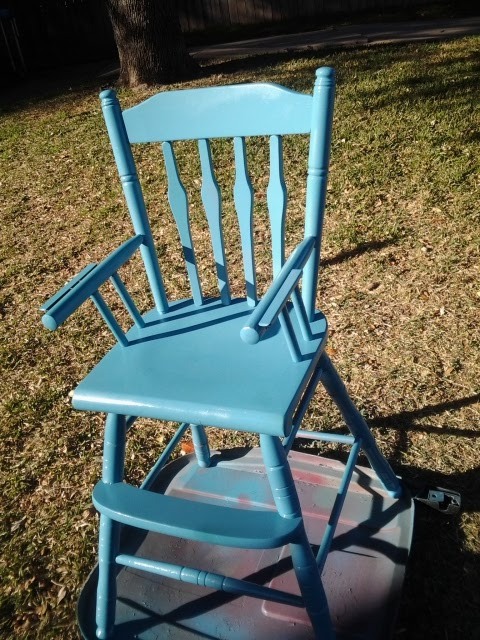 I just repainted Katie's high chair. It was originally my sister's and mine, then her kids, & now Katie's. And some people might think I am making some sort of announcement by painting it blue, but I assure you, I AM NOT! It just needed a fresh coat of paint. Katie doesn't use it much anymore, but I love having it around for company with little ones. I will keep it for my grand kids. I wonder how many layers of paint it will have on it by then? I had to use the picture of the cute one year old baby with the chunky thighs! And a cross outside a brighter turquoise. It was a little over a year ago! Still a dare devil! So the moral of the story is, spray paint is cheap, easy, and fast. It's a good thing, because I have a long list of items to be painted. I will get them done, one Little Einsteins episode at a time! Loving the turquoise! I need some color in my house in a bad way. Builder grade beige... blah!